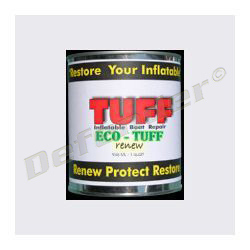 ECO-Tuff Renew is a one part waterborne acrylic vinyl product for boats that need to be freshened up. Simply paint the reconstructive ECO-Tuff over your existing material to restore, renew and protect your inflatable by adding a layer of strong acrylic vinyl that bonds directly with the surface of your boat. Note: Tuff-Coat, a Xylene solvent based product that is the industry standard for inflatable repair and restoration is still the answer for projects that are more challenging.